One of my favourite cuisines of all time is Mexican as you can no doubt tell by the many Mexican inspired recipes and creations. That’s why I was thrilled when I found out that one of the lovely girl’s from my time at University had set up her own Mexican Street Food Company. Having visited her van and sampled her menu I was blown away with the vibrant flavours and delicious food she produced and so I thought it would be a great idea to feature one of her lovely healthy Mexican recipes here for you all to try. So without further a do…. ‘Hi, my name is Sophie and I head up Cafe Horchata specialising in authentic, fresh and healthy Mexican street food. Mexican food is becoming increasingly popular in the UK, and people are starting to see what authentic Mexican food really is: healthy, vibrant and completely delicious. It can still be a bit tricky to get hold of some of the specialist chillies and ingredients from UK supermarkets, but you can still give Mexican food a good go at home. Here’s my twist on quesedillas, which you can easily recreate at home. Get some friends around and make a night of it – the way Mexican food should be enjoyed! Preheat your oven to 180°C and place the cubed butternut squash and garlic cloves onto a roasting tray in one layer. Spray with 1kal and season with salt and pepper. Roast, stirring occasionally, until tender throughout and lightly browned, for around 30 minutes. Remove the squash and garlic from the oven and place in a bowl. Remove the skins from the garlic, add the roasted cloves back into the bowl, then add in 2 tbsp of smoked paprika alongside the leaves from the sprigs of thyme. Mash until smooth and check for seasoning. Leave to one side. Remove any large stalks from the kale and put into a large pan with a splash of water. Cover and let steam for around 2 minutes until tender. Season with a touch of salt and pepper and combine with the squash mixture, mixing until it’s evenly distributed. Fry the chopped chorizo in a dry frying pan (the oils from the chorizo will help lubricate the pan) for around two minutes. Add in the squash and kale mixture to the pan and mix around until all of the delicious red oil has combined with the mash and it’s thoroughly heated through. Remove from pan and set to one side whilst you assemble the quesadillas. Spray a frying pan with 1kal and once warm, add in a tortilla. Cook for 1 min on a medium heat. Take a spoonful of the squash and kale mixture and spread across one half of the tortilla. You want the mixture to be about 1cm in depth. Cover the mixture with a sprinkling of the grated cheddar and fold over the other half of the tortilla, so you get a half moon. Carefully flip the quesadilla and cook for another two minutes or until golden brown on both sides. Place on a heat-proof plate and put in a low oven to keep warm. Repeat the process with the rest of the tortillas and mixture until it’s all been used. 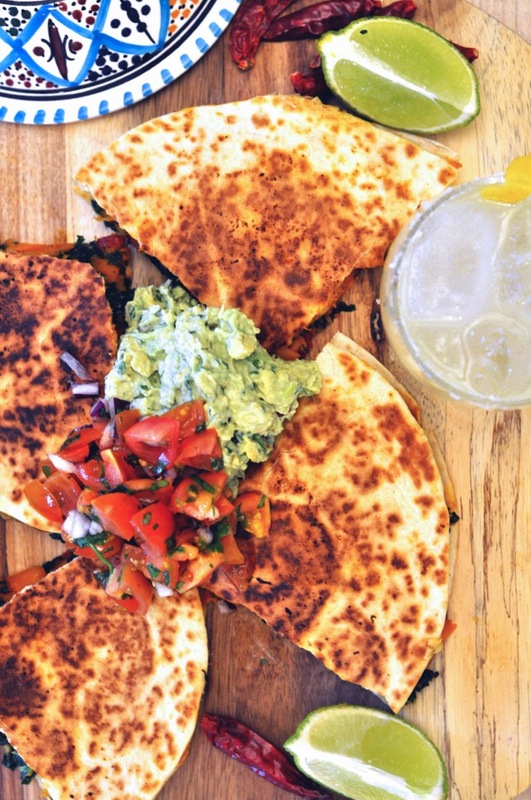 Once every quesadilla has been made, cut each one into three wedges and serve alongside some guacamole and salsa (don’t forget to add the extra points!). 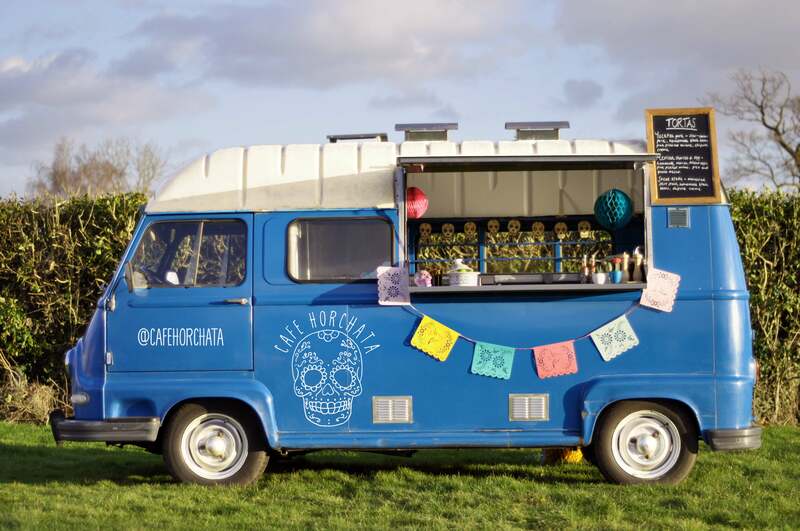 Serving up from their vintage 1969 Renault Estafette, they’ll be one of the main street food headliners of Manchester International Festival next week, Monday – Thursday. Find them on Festival Square from 12-9pm each day. If you can’t make it there, they can be regularly found at some of the biggest and best events in the North West.